HBO still doesn't want to tell us exactly when Game of Thrones season 8 is going to air, but they're dancing around the topic. We know for sure that the final season of the epic and wildly successful fantasy series won't debut until 2019, with the network taking 2018 off to make sure the last season is as satisfying and grand as possible. Now, thanks to HBO's programming president Casey Bloys, we know it will arrive during the "first half" of next year. The announcement was made during the Television Critics Association summer press tour. 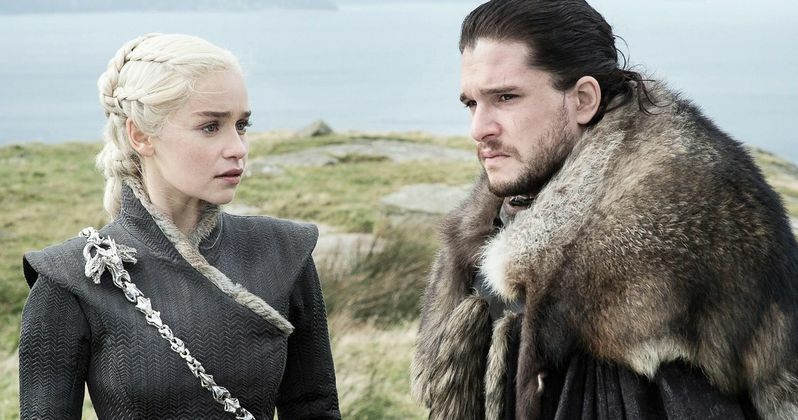 Even though the beloved series is set to end once this final batch of Game of tThrones episodes airs, fans have been dying to see how things are going to wrap up and that's left them feeling a bit impatient. With that, Casey Bloys offered the tiniest of updates on when to expect Game of Thrones back on the air. Though, he offered absolutely nothing in the way of plot details. Here's what Bloys had to say. "I don't think we've announced the date, so sometime in '19. I'm not gonna tell you what to expect, but it's pretty great." It was only when he was pressed for more information that Casey Bloys said that the show would return in the first half of 2019. And even that isn't much of an update, as the show typically premieres in late March or early April. Still, it's probably assuring for those who are feverishly looking forward to the show's final season to know that HBO isn't going to make us wait until fall 2019 to bring Game of Thrones back. The upcoming season will consist of just six episodes, which is shorter than usual, at least in terms of episode count. Each episode is said to be nearly as long as a movie, which should make up the difference. In other news related to the world of Westeros, Casey Bloys also debunked some recent rumors surrounding the Game of Thrones prequel. We recently reported that production may be getting underway on the spin-off series this October, which comes from Jane Goldman and has received the go-ahead for a pilot by the network. Bloys said that isn't going to be the case, but hopes that the new show will go into production in early 2019. "I don't know where that report came from, we're hoping to go into production in early '19." Game of Thrones is easily one of the most successful shows in the history of television. Not only is the series a monster, in terms of ratings, for HBO, but it also has a record 38 Emmy wins to its name, to go along with five Screen Actors Guild Awards and a Peabody Award. So, while they're surely sad to see it go, they're going to do their best to keep the ball rolling with at least one spin-off, with several others in development. This news comes to us from Entertainment Weekly.